enght 10" = 25,4 cm, hight 4" = 10,16 cm. Arch radius 11,5 ". The vertical axis leads through the center of the ruler and horizontal guides are 1/4" = 6.35mm. An angle of 45 degrees serves to rotate the arch during quilting process. 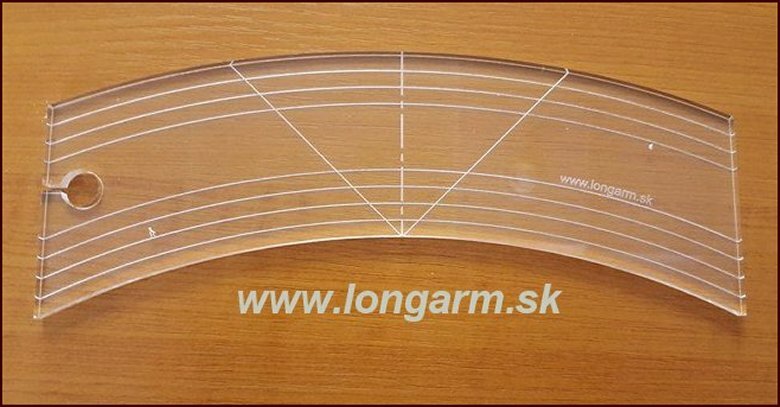 At the end of the ruler there is a quide hole for contour quilting and aplications. The quilting ruler is made from the most qualitative material and is supplied with a protective foil. The 1/4 inch thick material protects your sewing machine from damage of the needle and foot bar.